Today is the ninth anniversary of me quitting smoking cigarettes. A major accomplishment considering that with the rare exception of me taking a puff or two while intoxicated at the bar, I’ve removed this habit from my life for nine years. Let me take you on a brief history of smoking in my life. I smoked the first two years of high school. Pretty much every weekday, sometimes on the weekends when my mom was gone with her friends. About two weeks before the end of my sophomore year, I had a bad trip on angel dust and decided to quit drinking, coke, pot, pills and smoking cigs. I didn’t smoke cigarettes again until late 1998 (yes, I quit for pretty much 18 years) when I took the habit back up while having some stress in my life related to job and relationship issues. At first, it was only 2 or 3 on an occasion, but then turned into a daily habit by the middle of 1999. I started my divorce in Feb 2000 and was already a daily smoker. I rarely smoked more than a pack a day, similar to most of my other friends I spent time with. It never bothered me that I smoked for a good 3 years. Around the beginning of 2003, I made my first attempt to quit because I became tired of the habit. I was living with a friend who smoked and would start my day inside the cold garage to have a morning smoke. Several tries later, I ended up being successful on Friday morning – May 16, 2003. I took a nice long walk instead of going for a smoke and haven’t had a full cigarette since. As I mentioned above, there were a few puffs over the years and I enjoyed a cigar or a Prime Time (a cigarette-shaped cigar) a few times a year, but for standard tobacco cigarettes and the need or desire to have one is gone. I seriously doubt I will ever smoke again in my life. And it’s been at least 3 years since I’ve had a cigar or PrimeTime. Anyone else have a quitting smoking story? How many months or years has it been for you? 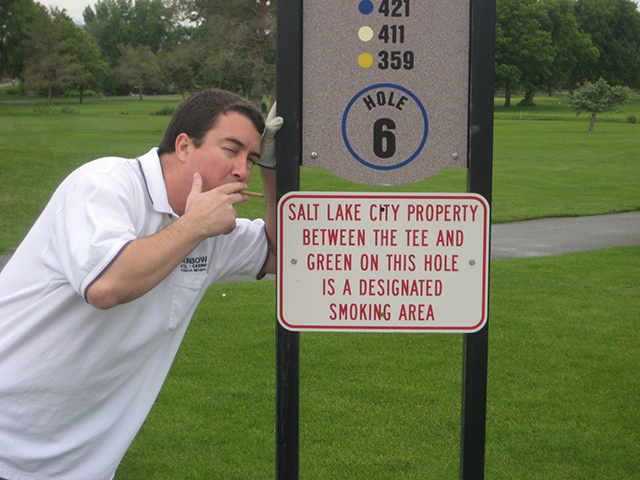 LOL… yes, a lot of smoking happened at that location. Congrats on nine years! That’s quite an accomplishment! I went cold turkey after building up quite a habit over the course of nine months. Suddenly I realized that I was looking forward to a cigarette more than I was looking forward to life, and it was time to stop. Cold turkey is a hard way to go, but when it works, it’s a needed way to break a habit. That’s a huge deal dude. Congrats on nine years. Yay Marty on nine years without smoking! That’s an awesome feat dude! Walking does a body good in so many ways. Congratulations!! I haven’t smoked for two years, and I’m hoping this is my final quit. I think it is because I know now that I can’t even have a few puffs here and there. Thank you, Britt. Congrats on two years quit. Congratulations mate. I smoked for a couple of years after leaving high school but it was always more of a drinking social thing. I didn’t really obtain a “habit”. So that all stopped when I was about 20. So that would mean I haven’t had a cigarette in 18 years. There are times I wished I was a social smoker, only having a couple while I drank. And congrats on cig free for 18 years.